Staying true to our commitment of bringing every leading enterprise platform under SearchUnify’s canopy, we now have a search client for ServiceNow as well. Our previous release, Mamba ‘18, saw the addition of ServiceNow as a supported content source. With its addition as a native search client, you can not only index incidents, knowledge bases, discussions etc. but also search across your connected repositories within ServiceNow’s infrastructure and help make your support executives’ lives easier. We hold the privacy & security of user data in the highest regard. Keeping that in mind, we rolled out support for an on-premises index a while back. 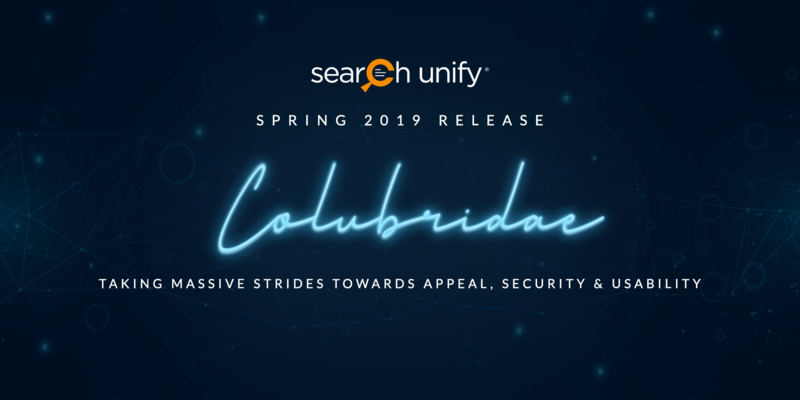 Now, Colubridae ‘19 takes things to a whole new level with the introduction of Asymmetric Data Encryption for an additional layer of security. To put it simply, SearchUnify now supports data encryption on public and private keys which means you will be the only one who has the key to open (decrypt) this virtual lock. In 2018, we introduced a chatbot that tapped on search insights for better contextual understanding which led to more engaging interactions. We wanted to make it even better. One way to go about it is by periodically assessing the impact of the conversations and improvising. Thankfully, AI makes it possible. It paves the way for bot analytics to record every interaction as well as its outcome. Did the bot identify the intent? Were the users converted? Or did they find the conversation useful? All this data now has its own space in the console. While it sounds good in theory, implementing KCS in the real world is challenging. However, we are here to help. We have engineered a dedicated add-on that facilitates KCS adoption. Once installed, it auto-populates several article fields from the case data. Admins can configure the fields too. The support representatives can create a knowledge article as and when they’re responding to a case and make it available for reuse and review with a single click. Ladies and gentlemen, that’s real-time KCS 101 for you. “What’s in a name?” said no marketer ever. Brand name is everything and, with the inclusion of domain mapping, you can now change the dashboard domain name to anything that aligns with your security or branding needs. Every KB article contains valuable information, or at least that was the intention. Your digital archive might contain millions of pages. How can you be certain that they’re actually useful? Simple, by asking the users. You can now take effective feedback by presenting the readers with a simple yes/no question like ‘Was this article helpful?’ This is particularly beneficial for organizations that found little value in their native platform’s rating algorithms or simply don’t have it. We saw a number of organizations with particularly large repositories struggling with duplicate data. They bring down the search efficiency and have a detrimental effect on user experience. But with the onset of Colubridae ‘19, things are about to change. SearchUnify now bundles with a duplicacy checker tool that, upon installation, can detect identical or similar knowledge across content sources. The admin lays the ground rules for a document to be treated as a duplicate and hence omitted from the search results. Machine learning has always been an integral part of SearchUnify’s DNA. And with the rise of Colubridae ‘19, we continue building on it. As a user runs a search query, deep learning proactively applies related facets in the back-end so that only results pertaining to the facet detected in the search query appear first. This helps boost search accuracy and CSAT. The very objective of search is to ensure people find what they need, when they need it. So we decided to bring the users a step closer to the answers they seek. Introducing, *drumroll* featured snippets! It’s a result that appears atop the results page, even before the fabled first search result and takes the 0 position, so to say. Machine learning automatically picks up the content for these snippets from the pages that best answer the search query. “To err is human; to forgive divine.” People can make mistakes while searching too. Your job is to ensure such things don’t mar their experience. Our advanced spell checker ensures typos don’t keep relevant information from users. When the engine receives a potentially misspelled query, it saves the users a lot of trouble by delivering results for the incorrect query as well as its corresponding intended query. Traditionally, only the users with a subscription for a platform could use a search client installed on that platform. For instance, only Salesforce users could leverage a search client in Salesforce. That changes with the addition of hosted result pages. Now SearchUnify admins can effortlessly create a single sign-on enabled search client page which can be shared and used by anyone. Consequently, non-subscribers can access the Salesforce (or ServiceNow or any other platform’s) search client. What good is a solution that fails to win the customers by showering them with fluid experience? To achieve this feat, Colubridae ‘19 has a few tricks up its sleeve. Let’s say a user selects a number of facets to fine tune the search results. Later on, he/she tries to run another search, the facet selection will remain as it is. A small touch that makes a world of difference, don’t you think? As the name suggests, bookmarks allow the users to save some advanced queries which they think will come in handy later. Your support executives would like to see ‘unresolved’ cases under ‘X’ category from ‘last week’. This nifty feature helps them save a lot of time and maximize efficiency. If the admin doesn’t lay out complete taxonomy or misses a particular classification, the solution is smart enough to automatically add the necessary nested category when the results are derived from it. Last but not least, the entire console has officially improved by leaps and bounds. Now it not only looks more pleasing to the eye but also brings some useful enhancements to the table. To begin with, the admins can seamlessly toggle between light & dark mode, whatever floats their boat. The dark mode can come in handy. Next, graphs, tables, charts, etc. have been rendered a fresh look which breathes a new lease of life into the whole console. Finally, the experience of mobile users has also gone ahead several paces with every element of the console now supporting mobile devices.